Six thoroughbreds are in the top 10 of eventing horses in the US, with Kim Severson’s Winsome Adante leading the historical high point leaderboard with 1355 points. Irish sport horses also challenge at the sharp end of the leaderboard, with three making the top ten among the nine on the list, with the sole warmblood, Darren Chiaccia’s trakehner stallion Windfall II, making second place. Some 35 horses listed as thoroughbreds make up the top 50 (actually, 51, as there are ties for 47th and 49th), including several New Zealand and Australian-bred thoroughbreds such as Phillip Dutton’s Woodburn (Hereward the Wake), Karen O’Connor’s Regal Scot (King Delamere), and Will Faudree’s Antigua (Match Winner). Other than Windfall II (by Habicht) at number two, warmbloods do not appear to be a dominant force in the high levels of the sport. Of the other warmbloods, there is only Boyd Martin’s Remington XXV (Hanoverian by Rubenstein I) at 25th, the Selle Francais newcomers to the list Manoir de Carneville (by Gaub, Sinead Halpin, 32nd) and Fleeceworks Mystere du Val (by Veloce de Favi, Victoria New/Leslie Law, 37th), and the Swedish Warmblood Colombo (Selena O’Hanlon/Kyle Carter) in 45th. The only other breed making the top 50 list is Nathalie Pollard’s West Farthing, who is listed as British Sport Horse, but who is 7/8 thoroughbred and 1/8 Welsh Cob. While Winsome Adante (84.5% thoroughbred, 9.5% arabian, and 6% Irish) holds onto the top spot from last year, there have been other movements in the list. Courageous Comet moved into the third spot – ousting recent Hall of Fame inductee Giltedge who had enjoyed the spot for several years. 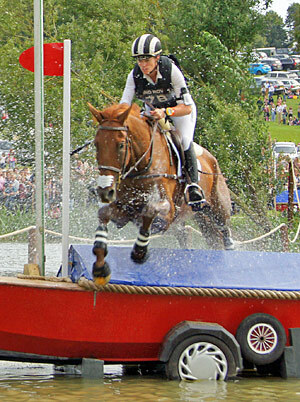 Ballynoe Castle RM also made a climb as he moved from 19th to 8th with over 200 points earned this year. Arthur jumped up in the rankings as he wasn’t even in the top 50 last year and now sits in 20th with 754 points. Remington XXV rose from 40th to 25th, while Mandiba moved up 17 spots into 29th.